With Facebook being stingy on on just how many of your fans get to see your Facebook posts, and Google just being plain weird when it comes to their organic rankings, the typical small business can start to wonder if the internet really is a good place to be found. There's so much competition out there, and the more "traditional" marketing channels seem to be tightly controlled by the platform owners. However, Twitter offers you a chance to market in a very open way. If you have 1000 followers, then your 1000 followers will get to see all of your posts - IF they're on Twitter at the time you publish them, of course (it's a bit like live TV, especially for those following lots of people!). However, knowing that there's no filtering going on, you can be pretty sure that the more followers you get, the more interactivity you will experience when you make a post. 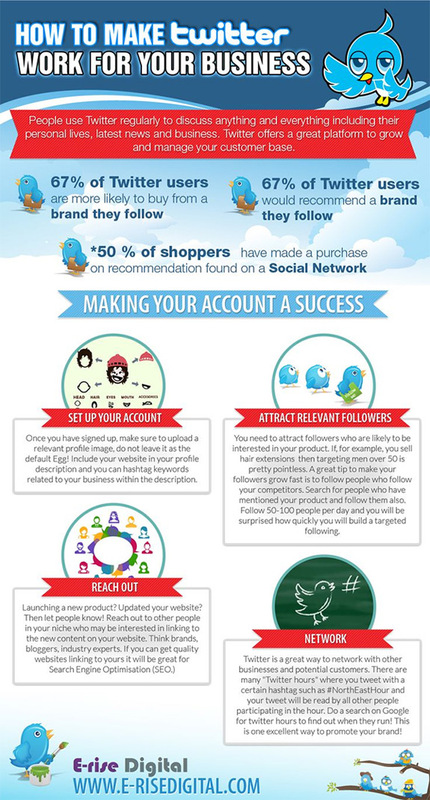 I've seen this myself, and it makes Twitter the genuine winner (in my view) as the most reliable marketing channel currently out there - IF you use Twitter the right way. Here's a useful infographic from http://www.e-risedigital.com/ to show you how to get started.